Meet Rhonda Covington, the one-woman office. Rhonda Covington is short on time. As the only public defender for the 20th Judicial District of Louisiana, she could be investigating cases, calling witnesses, scouring through evidence, taking photos at crime scenes (with her own camera), meeting with her clients’ families, writing motions, typing up pleadings, making appointments, answering the phones, answering the door, getting the mail at the post office, filling in timesheets, filing monthly reports, doing the accounting, paying the rent and utilities, cleaning the bathroom, dusting the furniture, sweeping and mopping the floors, taking out the trash, trimming the bushes, unclogging the plumbing, buying the toilet paper, or meeting with everyone arrested in a thousand-square-mile area just north of Baton Rouge, within 72 hours of their arrest. Part three of a three-part series about the underfunded public defenders of Louisiana. This series was reported in partnership with Guardian US, the award-winning US digital edition of the Guardian. Download the Guardian app, sign up to be a Guardian Member, or follow Guardian US on Facebook or Twitter. Every Wednesday, she makes an all-day trip to the infamous Angola prison to meet with clients. Every other night, she visits inmates at the local jail. She also appears in court almost daily, where she handles all types of cases — juvenile and adult, misdemeanor and felony. Earlier this year, following what Gov. John Bel Edwards’ office called “the largest budget crisis in our state’s history,” the Louisiana public defense system spiraled into fiscal ruin. Public defenders who had long depended on a highly unstable source of funding — traffic tickets — now saw their revenues slashed further. 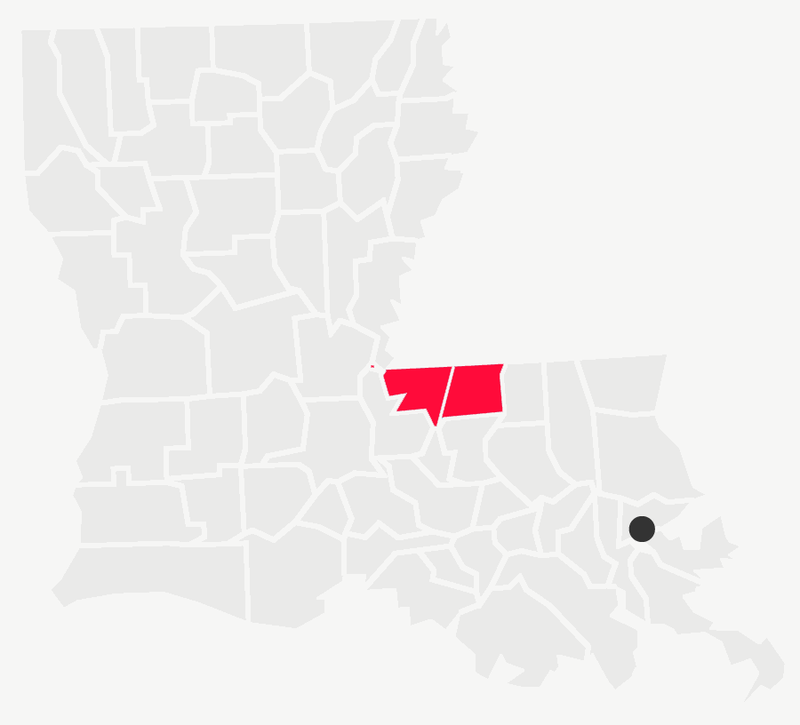 Soon, many districts were finding makeshift ways of getting by — including Caddo Parish, which conscripted tax attorneys, real estate attorneys, and other novice recruits from the private bar to fill in for the overwhelmed defenders. But in other towns, public defense offices have been left to fend for themselves. Stripped of full-time attorneys, investigators, translators, social workers, and support staff, they are now little more than ragtag, part-time squads. State funding covers a percentage of the 20th Judicial District public defender office's expenses. In 2015, the office had 943 cases. Note: State limit is the maximum number of cases that an attorney should handle a year. It can be a combination of felony, misdemeanor, juvenile, mental health, traffic, capital, and appellate cases. State funding does not include local revenue, which fluctuates significantly every month. In the 16th Judicial District, for example, a single public defender stands by as groups of up to 50 mostly black, poor defendants are convicted of and sentenced to major felonies — all at once, all together — in a hearing that lasts a few hours or less. And in the 20th, exactly one woman, Covington, is employed full-time to represent poor people accused of crimes. Because her district initially received only $34,086 in assistance from the state last year to run a public defender’s office that covers more than 900 cases across two parishes, East Feliciana and West Feliciana, Covington has been forced to cut just about everything but herself. She recently dismissed an attorney (savings: $38,400 a year), reduced her secretary to part-time ($7,194 a year), canceled the office’s cell phone plan ($1,829.28), and discontinued housekeeping services ($2,400). She saves another $1,000 a year by having an inmate work crew mow the yard outside her office. Covington, whose clients call her “Ms. Rhonda,” wears a medical boot on her right foot because she tore a ligament a few months ago while running to the courthouse. She no longer has any health insurance, let alone worker’s’ compensation, for the injury. She gets help around the office from two contract lawyers who chip in two days a week, and a makeshift office corps of two part-time, $15-an-hour paralegals and an intern during the summer. There are also her “office managers” — two cats, named Liberty and Justice. For All died a long time ago. Covington’s office handled more than 900 cases in 2015. On a Monday in June, Covington is frantically prepping the docket for her next session in court. She can usually be found with a giant Sonic cup of Diet Coke in the crook of one arm (“I’m addicted,” she says) and a handful of files in the other. Zahorchak is making copies of motions for her to sign while the phone is ringing off the hook. “Public defender’s office,” Covington answers. “Hey dear, how are you? Would you hold, please?” She brings a second phone to her other ear. “Public defender’s office, Rhonda speaking… Oh, you’re Eric’s mother? His next trial date is October 3,” she says from memory. Covington pours another Diet Coke, using her shoulders to keep the two phones pressed against her ears. The DA’s office in Covington’s district, after all, handles a similar caseload but with about $1 million more in its budget. She used to be able to afford a translator, but now, whenever she has a Spanish-speaking client, she has to rely on a police officer to translate their private discussions — which, she says, is a conflict for obvious reasons. She also had a case a few years ago in which a handwriting expert saved her client from going to jail, but she definitely would not be able to afford that now. When Covington gets to the jail, she is greeted by a chorus of “Heya there, Ms. Rhonda!” She walks past a long, white board with the names of almost a hundred inmates scribbled on it. Most of them are her clients. State funding covers a percentage of the 16th Judicial District public defender office's expenses. In 2015, the office had 10,403 cases. 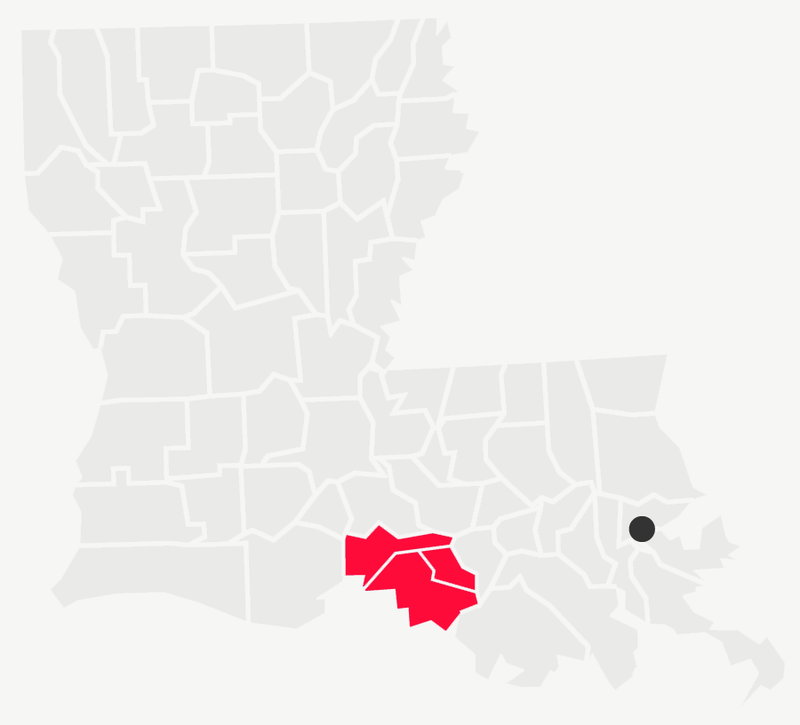 Fifteen poor, black men shuffle into a courtroom​ in southern Louisiana’s Cajun country, dressed in orange jumpsuits and shackled at the wrists, waist, and ankles. As they file into the jury box — which today is serving as the “plea box” — their chains jingle against the floor. Here in the 16th Judicial District, at the St. Martinville courthouse, it is “felony plea day,” with Judge Gregory Aucoin presiding. Many of these defendants have not discussed their cases with their public defender yet and will have about 30 seconds to speak with him this morning. “Yes sir,” they will all say, down the row. And just like that, with no time for arguments to be heard in each of their separate cases, they will have all pleaded guilty together and will be headed to prison for years, sometimes decades. Last year, the 16th district’s public defender’s office was forced to cut $311,000 from an already skeletal budget of about $1.5 million. As a result, they offered increasingly cursory assistance at these mass hearings, in which up to 50 defendants are collectively marched into a courtroom then convicted and sentenced as a group to major felony charges carrying up to life in prison. The Iberia Parish courthouse in New Iberia, La. Mass pleas are taking place here and throughout the state. “Mass pleas” of this sort are not unheard of in Louisiana and elsewhere in the country, especially in states with chronic public defender problems, including Pennsylvania, Utah, Michigan, and Missouri. Usually, however, it is a process reserved for much smaller groups of defendants, especially in misdemeanor cases, while major felonies involving the possibility of significant prison time receive more individualized attention. LeGros holds up a legal pad, and over a dozen people stream forward. He then gives their names to an assistant, who rummages through several mammoth file boxes, looking for each case. One of the defendants, Brandon Washington, is facing burglary charges. He says he used to have a paid attorney but lost his job at a Halliburton factory and had to turn to the public defender. Several months after making that switch, he has no idea who his lawyer is and has never talked to him. “I think it may be that guy,” he says, referring to LeGros. LeGros soon makes his way into the jury box with the men in jumpsuits and chains. He asks for their names, calling back to his assistant to see if she has the relevant file. Then he gives each the option of making a deal, and if they say yes, he shouts over to the DA. “That one’s a theft case, we’ll do a deal,” shouts the DA. “Okay,” says LeGros, after checking quickly with the defendant. As more deals are made across the room, there is little discussion of the nature of each case, or of the background and circumstances of each defendant. Every agreement is made in a matter of seconds, weighed and considered by the defendant for only a moment. Ultimately, no defendants will plead “not guilty” today and go to trial. In fact, of the 4,492 felony cases in this district last year, there were only eight jury trials, and not because only eight people believed they were not guilty. The court schedule sets aside one week for trials every three months, and anyone who wants a trial has to wait, usually in jail, for one of those dates to come around. The public defenders, with no time to be more thorough, advise their clients that pleading is the surest, safest way to go. When everyone has been prepped for the “mass plea,” a bank of white lawyers — defenders and prosecutors seated close together — face the panel of black defendants. The judge, Aucoin, starts reading off their pleas. He collectively informs them of their rights, and in an instant, all are felons. Yet the group pleas are only partly the result of an underfunded public defender’s office, says Christopher Murell, a civil rights attorney in New Orleans and the executive director of the Promise of Justice Initiative, a criminal justice reform organization. It is also about a courtroom culture — on the part of judges, DAs, and public defenders alike — of trying to get all the cases processed expediently, without friction. #1: How to go about getting the wait list moving. #2: Review who needs an attorney. When she took over the office in March 2015, Bonin thought she would begin by raising expectations. Her plan was to get control over the caseload, promote performance standards, and demand that her attorneys file more motions and have more meaningful conversations with their clients. She never considered that more than a year later, the attorneys would be watching helplessly during mass hearings like the one in St. Martinville. But Bonin soon realized that when an office is perpetually on the brink of bankruptcy, little else is possible. She could not afford enough attorneys to actually discuss pleas in advance, let alone develop relationships with defendants. Nor could she find good, experienced lawyers who would work for her in the first place, given how little she was able to pay them. The ones she already employed needed to work two jobs to supplement their salaries, which begin at $34,000 a year. One of Bonin’s lawyers had 345 active cases but was working only 15 hours a week. The rest of the time, she ran a private practice. In the 16th Judicial District and across Louisiana, things have improved slightly for public defenders since July, when the state legislature’s new budget went into effect. Controversially, it slashed funding for the lawyers who represent defendants in death penalty cases and shifted that money to the overwhelmed district-level defenders. Now, defendants facing the death penalty are finding themselves on wait lists for legal counsel. But even with the shift in the budget, Rhonda Covington still labors alone, and the mass pleas have continued. A public defender goes over to them, learns their names, and makes a deal. Then the judge starts in, mass-processing them by reading off their rights. “Yes sir,” they all answer. “I can’t hear you. Say, ‘Yes, sir,’” the judge says to one defendant. The public defender is not paying attention. He is talking to the next batch of defendants, scribbling down their pleas.